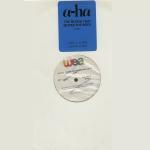 The 7"-release features a colour shot of the band (Morten, Mags & Pål) by John Paul with a large purple and white a-ha-logo on a blue background down the left side and title in blue at the top. 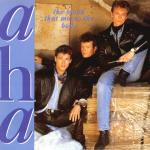 The reverse is white with a purple and white a-ha logo on a blue background printed vertically along the left hand side. In addition there are four coloured shots including one promoting the album "Stay On These Roads" on a white background, while the track listing is printed in a light purple colour. The 7" features the album versions of "The Blood That Moves The Body" plus "There's Never A Forever Thing". There is also a box-sleeved "Special Limited Edition" available in the 7"-format. Professing to include colour postcards this release falls short of the expectations and as far as we know only offer black and white postcards. The front of this limited edition is identical to the regular release except the misguiding information printed in white capital letters right above the song-title. The reverse of this spined sleeve is plain white with track listing in small light purple letters and an envelope opening. This box-sleeved edition contains the regular picture sleeve and record. The regular 12" release features the "Extended Version" (5:26) produced by Alan Tarney, in addition to the album versions of the 7"-single. Also available is a stickered limited edition 12" including a 22"x22" colour group-poster (Morten, Mags and Pål sitting on reels of tape- by John Paul) with light blue a-ha-logo in the top right-hand corner. Another tasty item is a limited edition 12" picture disc featuring the same tracks as the regular 12" edition. 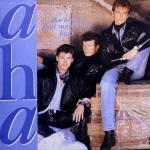 The front offers a colour group-shot (Mags, Pål and Morten - taken at the same photo session as the picture on the limited poster), while the a-ha-logo and the single-title is printed in light blue letters right below the centre of the record. The reverse has the same four shots as the 7" and 12"-releases on a light grey background. Sixteen small light blue a-ha-logos are printed all the way around the edges of the disc. The 3" CD comes in a 5" jewel case with a black plastic adapter. The cover is as the 7" single only with a white border. The reverse of the insert is white with a large vertical grey a-ha-logo on the left and grey titles. 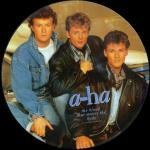 The German made CD is silver with dark grey titles, "a-ha" and WB-logos. The tracks on the CD are the album versions of "The Blood That Moves The Body", "There's Never A Forever Thing", the extended version of "The Blood That Moves The Body" plus the single version of "The Living Daylights". 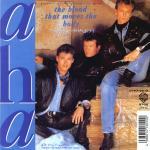 Brazil: The is a promo 12" which comes in a plain white sleeve with a large blue promotional sticker which reads "a-ha The Blood That Moves The Body (4:05) LADO A: 33 RPM LADO B: 45 RPM". Both sides of the disc feature the album version, with side A playing at 33 RPM and side B at 45 RPM. Germany: Some promotional copies of the 7" come with a product fact sheet with information in German. There is also a German test pressing which comes in a black WEA sleeve, has a hand written white label and large hole in the centre. Italy: There is a 7" jukebox promo which has a-side "Lost In You" (4:20) by Road Stewart and b-side "The Blood That Moves The Body" (4:05). It comes in a white paper sleeve with a white, yellow and blue sticker at the top with track titles. a-ha are listed at the top (even though they are on the B-side) on the yellow background. Japan: The 7" has insert similar to the UK 7" but with white and blue Japanese writing. The reverse has a black and white picture of a-ha with guitars, the lyrics in Japanese and English, small pictures of "Stay On These Roads" and "Road Club"-albums and the Japanese tour dates for 1988. The 3" CD comes in a snap-pack, the top half of the front cover is like the UK single and the bottom half is white with a large blue a-ha-logo down the left side and 3 small colour pictures down the right and some blue Japanese text. The reverse is white with black text including the Japan '88 tour dates and the lyrics (in English and Japanese) for the song. There are two tiny black and white pictures advertising the album and the mini album "Road Club". The CD is silver with black titles and a red WB-logo. South Africa: The South African promo 7" comes in a TUSK Music Co.(PTY) Ltd black and white paper record sleeve. Brazil promo The Blood That Moves The Body // The Blood That Moves The Body 6WP.0061 (No.57)?